I have been meaning to make mole since I saw Chocolat and the beautiful scene where Vianne, played by Juliette Binoche, prepares a whole feast with chocolate featuring in every course. Unfortunately it took almost ten years to actually make it, as I was always afraid of what chocolate would taste like in a savoury dish. The opportunity arose with this round’s Cook the Books hosted by Deb of Kahakai Kitchen, who picked the spicy bestseller by Laura Esquivel, Like Water for Hot Chocolate. In a women-dominated family ranch in Mexico, we follow the life and deeds of Tita, a fiery girl who loves to cook, but is tormented by her horrible mother, Mama-Helena, who does not allow her to have a life outside of serving her. So Tita cannot marry Pedro, the man she loves, and all this frustration causes her to channel her emotions into her cooking. Strange things happen when people taste her food: they become lustful, angry, or happy, depending on what state of mind she is in. My favourite part of the book and one I could relate to 100% is when Tita managed to produce milk in order to breastfeed her hungry newborn nephew, as her sister didn’t have any herself and the baby was crying inconsolably. I think this summarizes beautifully who Tita is as a person: a giving, warm and loving woman whose passion for feeding all those around her becomes the core of her existence. The recipe for mole describe in that part of the book sounded delicious, but complicated at the same time, so I decided to follow another recipe instead which, coincidentally was inspired by the book as well. 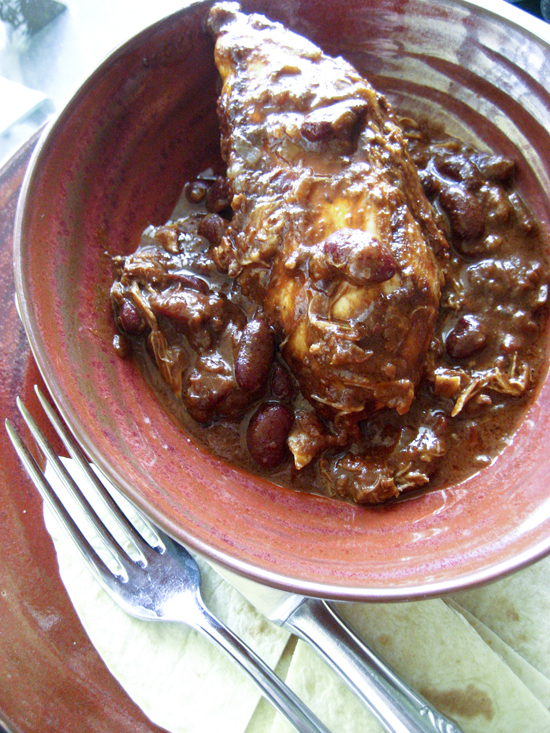 The recipe for chicken mole I cooked up comes from the book Unwrapped: Green & Black’s Chocolate Recipes: From the Cacao Pod to Muffins, Mousses and Moles. It is a very easy recipe that has amazing results. Even M. who was very skeptical at first as he doesn’t like chocolate very much, absolutely loved it. What is there not to love anyway? The meat falls off the bone, the sauce is rich, spicy and succulent and the chocolate just gives an extra layer of flavour without becoming too obvious. Plus it is dead easy to make. We enjoyed it with some tortillas the first day and as a sauce on orzo the second. I would definitely be making it again! Για το Cook the Books αυτού του γύρου είχαμε να διαβάσουμε το best seller της Laura Esquivel, Σαν Νερό για Ζεστή Σοκολάτα. Η ιστορία διαδραματίζεται στο Μεξικό των αρχών του αιώνα και περιγράφει τη ζωή και περιπέτειες της Τίτα, μιας κοπέλας με ταλέντο στην κουζίνα, που μαγειρεύοντας μεταφέρει και τα συναισθήματά της στο φαγητό. Το βιβλίο είναι γεμάτο με συνταγές και οι ζουμερές περιγραφές τους ήταν ιδιαιτέρως απολαυστικές. Αποφάσισα να δοκιμάσω την τύχη μου με ένα φαγητό που περιγράφεται στο βιβλίο και που ήθελα να φτίάξω πολλά χρόνια τώρα, και συγκεκριμένα από τότε που είδα το Chocolat και τη σκηνή όπου η Βιάν (Ζιλιέτ Μπινός )μαγαιρεύει ένα ολόκληρο γεύμα με βάση τη σοκολάτα. Είναι αλήθεια βέβαια πως αυτό που με σταμάταγε τόσο καιρό ήταν η χρήση της σοκολάτας στην σάλτσα, γιατί δεν είχα ιδέα τι αποτέλεσμα θα είχε η χρήση της σε αλμυρό φαγητό. Preheat the oven to 150 oC. In a large casserole lightly brown the chicken in 3-4 tbsp of olive oil and then add the garlic and onions. Once the onions are lightly browned, add the tomatoes, kidney beans with their juice, smoked paprika or chillies and 50 g of the chocolate. Bring all the ingredients to a simmer and then cover the casserole tightly and place in the oven to cook for about 1hr 30 mins. Skim the surface to remove the fat from the chicken and adjust the seasoning. Finally, add the rest of the chocolate. Enjoy with tortillas or some rice/pasta to mop up the lovely sauce. For a vegetarian version, omit the chicken and double the quantity of beans. Προθερμάνετε το φούρνο στους 150 oC. Σε μια κατσαρόλα που να μπαίνει στο φούρνο σοτάρετε ελαφρά το κοτόπουλο με λίγο λάδι μέχρι να πάρει χρυσαφί χρώμα από όλες τις πλευρές. Προσθέστε έπειτα τα κρεμμύδια και το σκόρδο. Μόλις τα κρεμμύδια πάρουν χρώμα προσθέστε την ντομάτα, τα φασόλια με το χυμό τους, τηςν πάπρικα ή το τσίλι και τα 50γρ από τη σοκολάτα. Αφήστε τα υλικά να σιγοβράσουν για λίγο και έπειτα κλείστε καλά την κατσαρόλα (ή μεταφέρετε το φαγητό σε πυρίμαχο σκέυος με καπάκι) και βάλτε το στο φούρνο να αργοψηθεί γαι περίπου 1 ώρα και 30 λεπτά. Αφαιρέστε όσο λίπος μπορείτε από τη σάλτσα και διορθώστε τη γεύση με αλάτι και πιπέρι. Τέλος προσθέστε την υπόλοιπη σοκολάτα. Σερβίρετε με τορτίγες ή ρύζι/μακαρόνι. Για χορτοφάγους αφαιρέστε τοι κοτόπουλο και διπλασιάστε τα φασόλια. Maria, I suggest you cook mole and not tell them what’s in it. I am sure they are going to love it, as t has a distinct smokey taste from the paprika/chillies. I have always wanted to try making Mole at home but never gotten to. This looks like an amazing dish and it’s no wonder your husband loved it! I have tried once and with rabbit. I was also a bit scared like you, but the result was fantastic :D. Chicken also sounds (and looks) great with the chocolate. Wasn’t Chocolate a superb movie? I loved the film too, but I think I need to see it again and remember, now that I have read the book! Ioanna, you are quite versatile in the kitchen and I know M appreciates your varied tastes in cuisine. This is what real Mexican food is all about. Looks delicious but as much as I love mexican food beans have always been hard to digest. Do you think we could substitute the beans with something else or omit them altogether? You could also try chickpeas, but if you find those hard to digest as well. just omit them altogether. It is possible that you might need to thicken the sauce afterwards with a bit of cornflour, although the chocolate does work as a thickener too. I have cooked with chocolate once and I loved it. I made venison in a chocolate sauce and it was incredible. I always see recipes for mole but never dared to make it, thought it was a rather difficult recipe. I would love to try it though. Thanks for the recipe! A question, could I use an 85% chocolate or would that be too much? From what I read on the internet mole is also made with cocoa so I think you could. Great post, Jo! I love your analysis of the book and this dish looks so sumptuous! Your chicken looks very enticing. I am now very curious to try mole. Last December I made a chicken recipe with chocolate and it was so good, I am now very receptive to use chocolate in savory recipes. I’m saving your recipe for a quick and easy version of mole. Someone asked about thickening with something other than beans (which are not typical for moles) I’ve seen mole thickened with plantain, pieces of bread, nuts and seeds of various sorts (pumpkin seeds work well). I’ve never attempted to cook anything savoury with chocolate before either. Guess I have the fear that it will taste weird in a savoury dish, but your post just has me convinced that I will have to give it a try someday. It looks gorgeous! 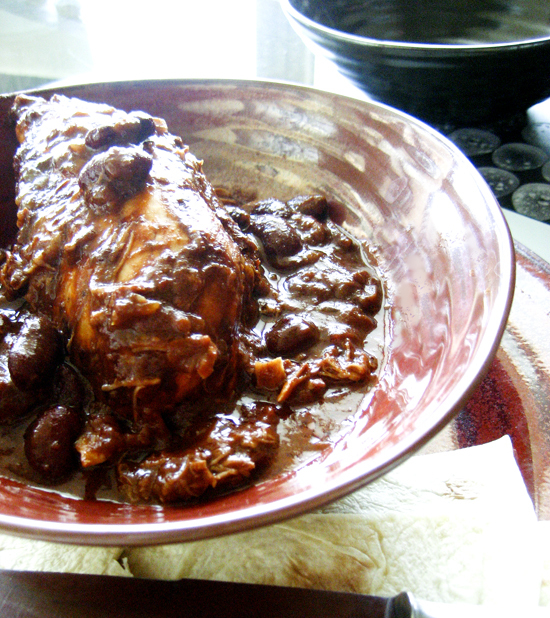 Making mole is a big accomplishment and the results are always delicious! Great job. I second Peter’s comment that this is what REAL Mexican food is all about. That looks lovely! I do a couple of savoury things with chocolate – I make a balsamic & chocolate reduction that is really delicious with steak or duck, and I sometimes add some chocolate to sauces for venison. I have been meaning to make mole for SUCH a long time and yours looks incredibly delicious. A perfect choice for Cook the Books!